Bitcoin’s dominance rate, or its share of the total cryptocurrency market, is on the verge of falling below 50 percent for the first time in over seven months. At press time, the world’s largest cryptocurrency accounts for 50.9 percent of the total capitalization of the entire market and fell as low as 50.54 on March 17, according to data from CoinMarketCap. Before 2017, bitcoin’s dominance rate was perpetually in excess of 70 percent, but it began to deflate as new cryptocurrencies were created and sold to investors in initial coin offerings (ICOs), causing bitcoin’s dominance rate to drop to a low of 32.48 percent on Jan. 13, 2018. Since, Aug. 11 of last year, however, bitcoin’s share of the cryptocurrency market has not fallen below 50 percent. Having traded between $3,200 and $4,300 since Dec. 2018, bitcoin’s recent drop in market dominance can be attributed to a strong performance from the broader altcoin market, comprised of all cryptocurrencies excluding bitcoin, rather than any significant depreciation to its own market. In the past 90 days alone, names like enjin (ENJ), binance coin (BNB) and litecoin (LTC) have witnessed significant price increases of 406, 181 and 97 percent respectively, according to data from Messari. 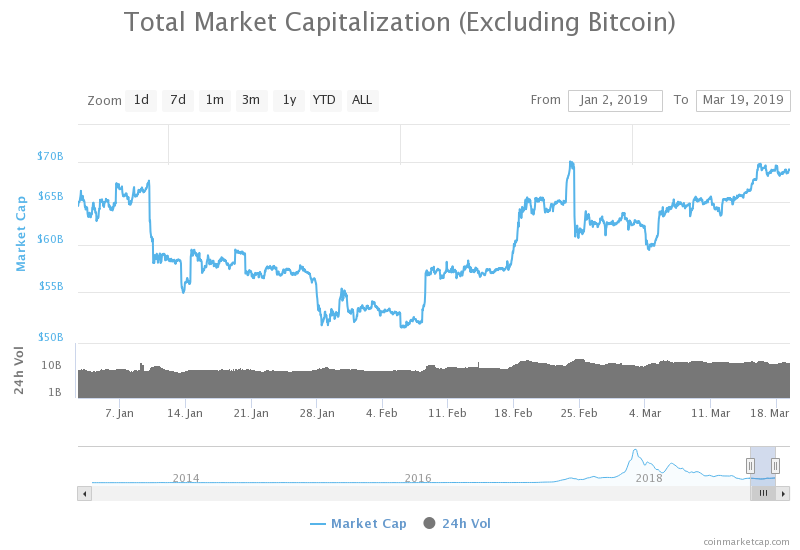 As a result, the market capitalization of all cryptocurrencies excluding bitcoin has grown 33 percent since hitting a 2019 low of $51 billion on Feb. 6 to its current value of roughly $69 billion. In the same time span, bitcoin’s market capitalization has also seen notable growth, but to a lesser extent than the altcoin market. Since Feb. 6, bitcoin’s market cap has increased from $59 billion to its current value of $71 billion – a jump of 20 percent. Bitcoin’s shrinking dominance could be seen as a sign the crypto markets are shifting to a “risk-on” environment where investors prefer riskier assets, as altcoins are perceived to be. The rate falling below 50 percent would be a greater indication of this type of sentiment coming to fruition. As it stands, the total capitalization of the broader cryptocurrency market records $140.6 billion, down 83 percent from its all-time high of $835 billion set on Jan. 7, 2018. Disclosure: The author holds several cryptocurrencies, please see Sam’s author profile here for more information.